On Thursday evening, April 5th, Sarah arrived from Covenant…at church…in the middle of our Maundy Thursday meal and service…with a puppy…who immediately became the center of attention for the few moments before Sarah took him outside to find a place to tie him up. Said puppy was Serena’s birthday present. 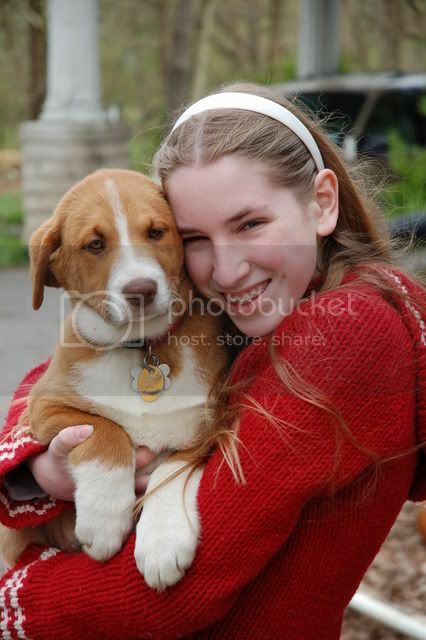 Serena took one look at him and named him Copper. We’ve been used to Ginny’s Border Collie/Australian Shepherd, high-energy behavior. Copper is her perfect foil — loafy, floppy, and loving to just sit on your lap. Ginny rarely barks; Copper does. (I think there is definitely some hound in him, to judge from his bark). Ginny jumps up on you in her enthusiasm; Copper gets in front of your legs to make you stop and pet him, and almost trips you! Sarah says he is a lab mix. I say he is hound mixed with St. Bernard. Look at those paws! He’s going to be ENORMOUS! In spite of his size, though, Copper is a big marshmallow — so soft and floppy and huggable! The first night, he growled at Ginny, so Serena let him spend the night in the back vestibule to recuperate from his stressful day of travel and new surroundings. At 6 the next morn, we were awakened by mournful barks and yowls (the hound-dog type). So, he spent the first day or 2 inside the dog pen, getting acquainted with Ginny through the fence. They were fine playing together through the fence, or when Copper had his back to something. When out in the yard, however, Ginny would race around with excitement, and come back to bowl Copper over like Hobbes does to Calvin in the comic strip. Pretty soon, Copper began to hold his own, though. At the end of a week, Ginny is calmer, and they play together quite well. My yard is starting to suffer from Copper’s digging, and he is quite interested in the chickens and the peacocks. Lots of training is in order! 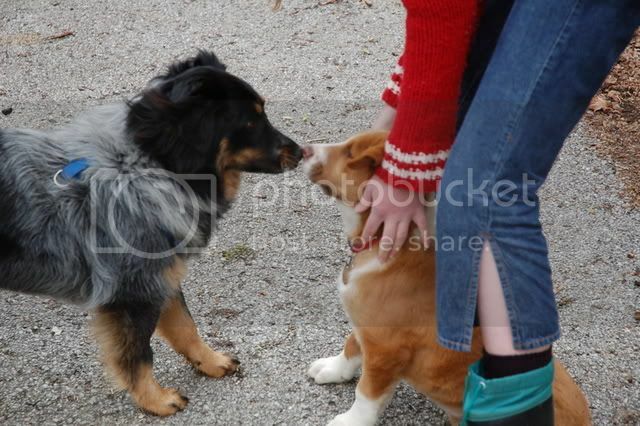 Here’s a photo of Copper and Ginny getting acquainted.